After it leaves Stantonbury Hill, Wansdyke is formed by a large bank and ditch through dense woodland, emerging beside the road leading to the village of Stanton Prior. The field to the right of this road was called Wansdyke Piece during the early 19th century, but all trace of Wansdyke has gone today. Colt Hoare could trace it even further, across Binces Lane, a track halfway between Stanton Prior road and Corston Brook. Therefore, it seems to most likely that Wansdyke has been ploughed out since, and the gap extends as far as Corston Brook. Just east of the brook, Wansdyke reappears just south of Dog Kennel Wood, where it crosses signs of ancient cultivation and increases in size to a broad bank. 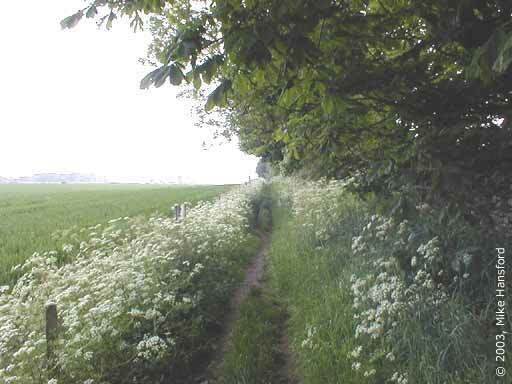 This section of Wansdyke, from Corston Brook to Park Farm, once also formed the northern border of Stanton Prior parish as far back as AD 963, when it was mentioned in an Anglo-Saxon charter. Here, it is crossed by an ancient Ridgeway, one of the branches of the north-south Jurassic Way, which was called the Bath herepath (military road) in a Bath Abbey charter in AD 963. 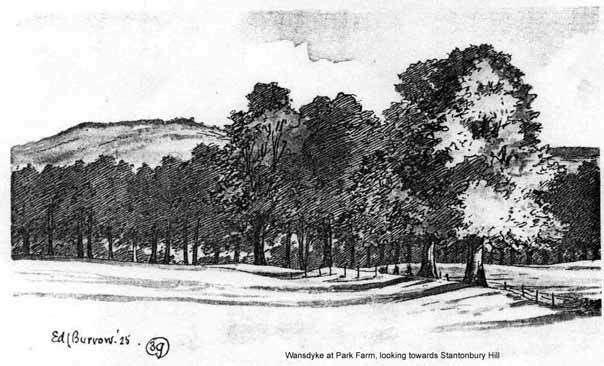 In the drawing (top), you can see Wansdyke at Park Farm, looking towards Stantonbury Hill. East of Park Farm, all trace of Wansdyke is lost once more, although one air photo noticed a shadowed low relief across the next two field on either side of Twelve O Clock Lane. This has led Fox & Fox to believe there was once a gap here, due to ancient woodland. However, as can be seen on other parts of Wansdyke on flatter land, it tends to be ploughed out sooner. Though I would not exclude ancient woodland, agriculture may be to blame as well. Just east of Pennsylvania Farm, Wansdyke is again to be seen both sides of the Newton brook. 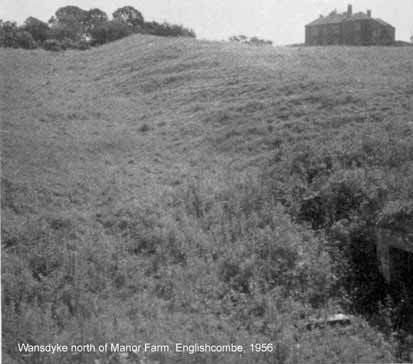 When it climbs out of the valley towards Manor Farm, Wansdyke again shows a bit of its old grandeur, showing an immense bank, as can be seen on the image taken in 1956 (click here to enlarge). 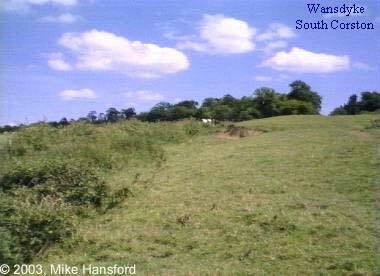 Here, Wansdyke crosses the remains of a large, circular earthwork, directly to the west of Manor Farm. 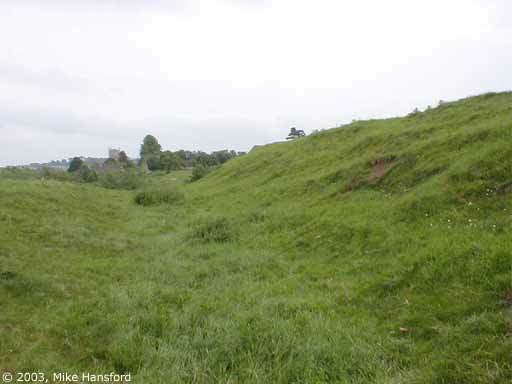 Although it may have been a simple enclosure, possibly bivallate (though these banks are no longer shown on modern maps), this raises the suspicion that it was larger. Fox & Fox suggest a more recent date, but Wansdyke seems to overly and even crosses through its centre, before arriving at the village of Englishcombe. Wansdyke then traverses the field between Newton Brook and the village. The earthwork is lost when it reaches the first houses, but from Pennsylvania Farm and a map it can be easily observed how the main street, along with both the church as well as a tithe barn, shows the same alignment as Wansdyke. The map shows the village as a main sightseeing point with great views across to Bath, which is almost without doubt the reason for the builders of Wansdyke why they chose this ground. 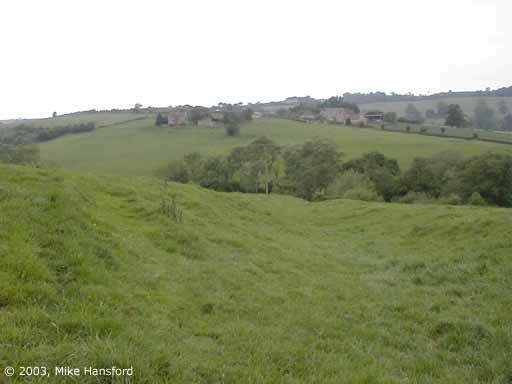 However, the village now obliterates all traces of the dyke, and it probably continued on the road going eastwards out of Englishcombe, though remaining on the high ground. Wansdyke does not show itself again until it leaves Breach Wood, where it turns quite sharply towards the southeast, following the high ground above Padley Bottom. The hill is steep, and the builders of Wansdyke clearly intended to use this high ground for their tactical advantage. This deep combe no doubt named the village of Englishcombe as well. 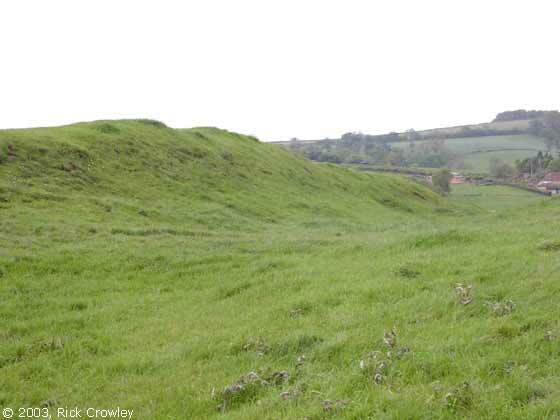 The clay-covered hill is still heavily wooded in places, and would probably have been even more so at the time of construction, thereby explaining why Wansdyke is missing today. The cliff would make Wansdyke quite superfluous, trees or no trees. 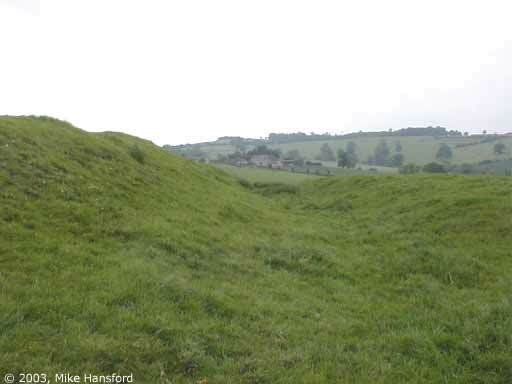 However, it also makes quite clear that Wansdyke intentionally veers away from the Avon valley and Bath. Between Breach Wood and Middle Wood, Wansdyke appears again in open pasture. The drawing shows Wansdyke between Breach Wood and Vernham Wood, looking north towards Twerton Hill and Kelston Round Hill (click here to enlarge). 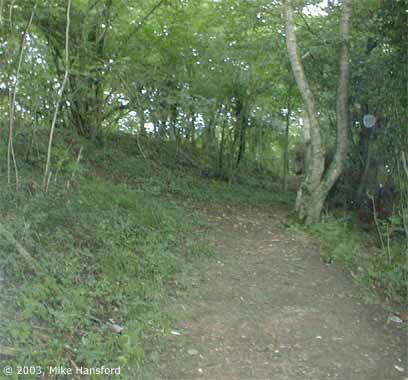 Though it still follows the curve of the combe below, it climbs steeply uphill to Vernham Wood. the dyke is gradually lost from view being ploughed down and dug out (claypits) along the top half of this stretch. At some point (now lost) just before entering Vernham Wood, Wansdyke again veers sharply back to the east. Inside the wood there a quite large bank can be observed, although this is probably not Wansdyke but an artificial scarp. Again, the steep wooded slopes may have rendered any earthwork superfluous. At this point Wansdyke runs again to the east, crossing the old Roman road near the crossroads of Burnt House Inn. There can be no doubt that the builders intended to block the Fosse Way at this point, controlling this major traffic artery to Ilchester and the Southwest. Why was this roadblock constructed this far south and not at the river crossing south of Bath? At this point I shall not go too deeply into this question, a short observation must do. Down at the river, a crossing would no doubt be defended, rather than allowing an enemy to enter higher ground. This has led scholars to believe that the builders of Wansdyke already lost control of the south bank, being denied the choice of terrain. However, any blockade that far down in the valley would mean a loss of view to either side. If one looks at the very straight alignment of West Wansdyke, it becomes obvious that the use of Maes Knoll and Stantonbury guaranteed a field of view along the whole of Wansdyke from Dundry to Odd Down. Furthermore, this rules out any occupation of Bathampton Down. 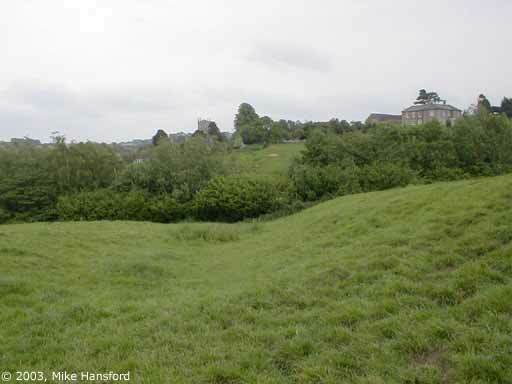 Had this vantagepoint over the Roman town been occupied, for sure Wansdyke would have used the fort or similar earthworks present on the hill. 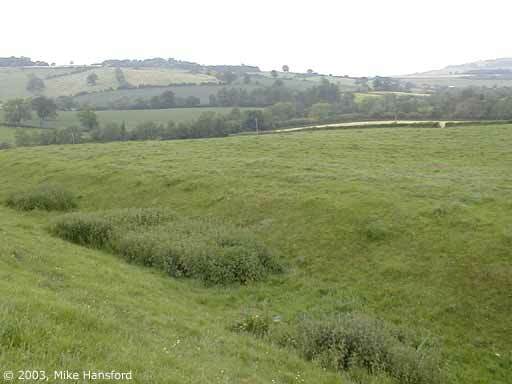 However, no trace of Wansdyke has been found beyond Horsecombe Brook, meaning that no use was made of the hillfort. I think this means that Fox and Fox were right in their conclusion that while the builders of Wansdyke were not able to choose their ground with complete freedom, this did not mean that the enemy occupied Bathampton Down. At the South Stoke crossroads and the Cross Keys pub the dyke disappears once more, its course marked by boundary stones and heading towards where the gardens end and the spring marks the start of Horsecombe brook. 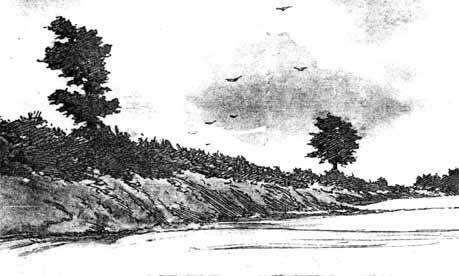 The drawing shows Wansdyke on Odd Down, near Cross Keys, in 1926 (click here to enlarge the drawing). 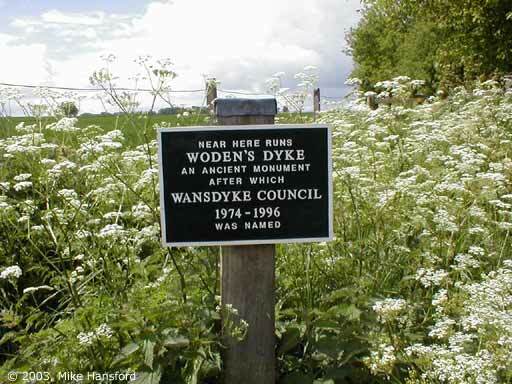 No evidence indicates that Wansdyke ever continued further east. Not even Colt Hoare saw any remains here in the early 19th century, and though several observers saw remains in other places, these consisted mostly of confused lines and branches south (Skinner, towards Frome) or north (Major & Burrow, to Bathampton Down). 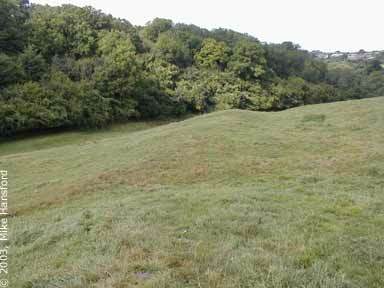 Crawford considered the possible use of the hillfort at Bathampton Down, but only as a vantage point, not in connection to Wansdyke. Fox & Fox disregarded even that possibility, and lack of any refurbishments may well mean they were correct. If ever there were traces of any continuation north, they have long ago been lost under housing and other developments. 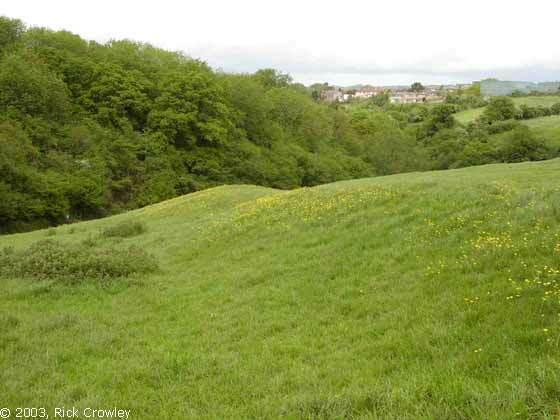 Wansdyke therefore most probably used the deep valley of the Horsecombe Vale, until it reached the Avon. I do not doubt that the river Avon formed the connecting part between West and East Wansdyke, but I believe a reasonable case can still be made for the Roman road as a boundary. For more on this, see section 5. Wansdyke at Park Farm, looking towards Stantonbury Hill, 1925. West Wansdyke at Park Farm, 1996. West Wansdyke looking west to Pennsylvania Farm. Another picture of Pennsylvania Farm, with Whistling Copse behind it. West Wansdyke at Englishcombe, looking northwest. West Wansdyke at Englishcombe, looking northeast to Twerton, Soutdown and Rush Hill. West Wansdyke at Englishcombe, looking east. 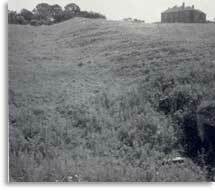 West Wansdyke at Englishcombe, looking east to Manor Farm, 1956. 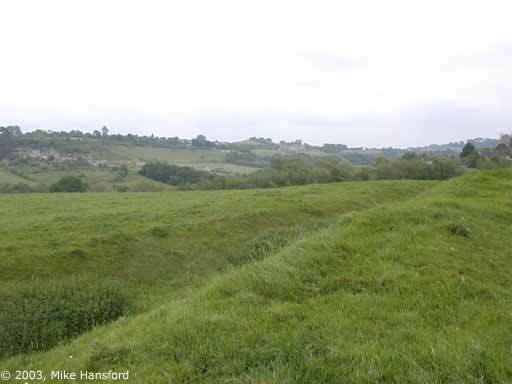 West Wansdyke at Englishcombe, looking east to Manor Farm, 2003. Heading for the south end of the wood. Wansdyke between Breach Wood and Vernham Wood, looking tnorth owards Twerton Hill and Kelston Round Hill, 1926. Leaving Breach Wood, looking back north. West Wansdyke on rising ground south of Breach Wood, with the houses of Rush Hill beyond. 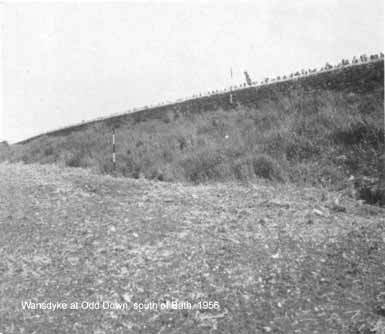 Wansdyke on Odd Down, 1926. 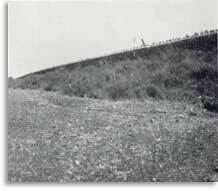 The straight line of West Wansdyke on Odd Down, 1956. West Wansdyke at Cross Keys, looking west to Odd Down, 2003. West Wansdyke at Cross Keys, with a tentative sign which at least shows some knowledge, 2003. Directions to Section 4 can be found here.